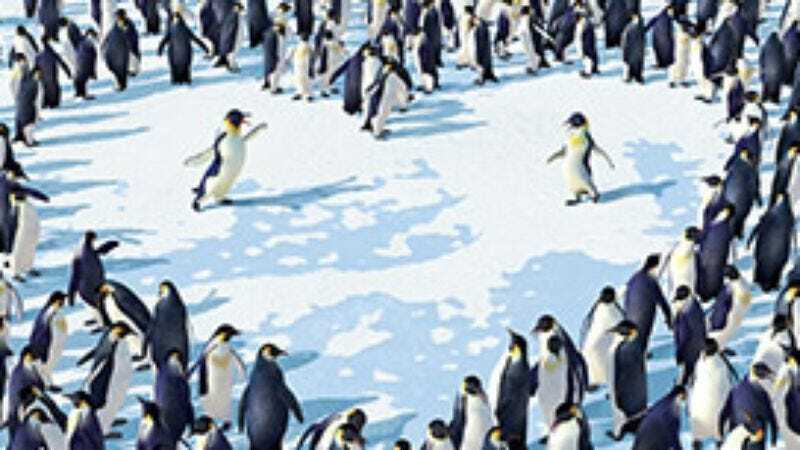 In a year so packed with CGI features about cuddly animals that kids might as well just move into their local theaters, there's no reason to think that Happy Feet might prove exceptional. Given how strongly it follows kid-film convention, with its bouncy musical numbers, adorably merchandisable characters, and excessive Robin Williams shtick, it actually looks exceptionally avoidable. But like an iceberg, it has more below the surface than above. It's a gorgeously rendered marvel that pulls out all the stops to wow its viewers, but in spite of its crowd-pleasing ploys, it holds onto its integrity with a smart and surprisingly deep story. In one of many potentially cloying plot points that Mad Max director George Miller pulls off with style, the film turns on the idea that Emperor penguins are each born with a "heartsong"; in mating season, they sing these songs to each other until they find a perfect complement. This plays out via a gloriously ridiculous Moulin Rouge-style medley, as sought-after penguin Norma Jean (Nicole Kidman) warbles Prince's "Kiss" to a group of suitors who eagerly answer with their own pop hits: "Let's talk about eggs, baby / Let's talk about you and me…" Ultimately, she swoons over a cornpone stud (Hugh Jackman) singing "Heartbreak Hotel." But their child, Mumble, (Elijah Wood) lacks a heartsong; when urged to express himself, he begins to tap dance, to everyone's horror. This leads to predicable children's-book messages about conformity vs. individuality, and a predictable troubled romance: Will Mumble find love with his childhood friend Gloria (Brittany Murphy) even though he's a dancing freak and she's a diva fox? Surprisingly, Miller and company wrap that plot early, moving on to service a story agenda so ambitious that at one point, the camera pulls all the way up into outer space for perspective. And along the way, they never miss a chance for a breathtaking chase or a staggeringly expansive Fantasia-like setpiece, with penguins performing complicated underwater ballets or holding a rave with the aurora borealis as a disco ball. Williams' grating, silly accents (in two major roles, and as the narrator) are a single sour note in a grand chorus, but even he gets off so many snappy lines that it's easy to go with the film's glorious thrill-ride mentality, wherein life isn't just a song, it's a Busby Berkeley number.